Welcome to the Friends of SUBA Blog Hop. What does SUBA stand for? SUBA stands for Simply Unique Business Angels, and is run by Pip Todman and Louise Sims. Back in August 2017 I attended a SUBA Training Course to help move my business into the Social Media arena. Pip and Louise have welcomed me with open arms and are constantly helping others like me to understand the systems that they use and built confidence to use them more so. There was another training course in February 2018, the group of Stampin’ Up! Demo’s who attended, decided to join up to create a blog hop so that what they had learnt could be put into practice. I was lucky to join this group and be able to show you what I have made for this month’s blog hop. This month’s Blog Hop is a Colour Combo Challenge using three of our NEW Stampin’ Up! colours; Soft Sea Foam, Shaded Spruce and Granny Apple Green. When I first saw these colours they reminded me of trees and leaves so I just had to use the Rooted In Nature stamp set for this project. I had a wooden square from Hobbycraft which I thought would look nice with leaves on it. I stamped the branch of leaves onto the wooden square in Shade Spruce Ink. Then I stamped the large and smaller leaves in Granny Apple Green Ink and Soft Sea Foam Ink to make a background. To give it some texture I die cut the large and small leaf dies in Shaded Spruce, Softy Sea Foam and Granny Apple Green card stock. These were then embossed using the emboss dies. I stamped a sentiment with Shaded Spruce onto a Soft Sea Foam circle and stuck it in the middle of the square. I wanted the leaves to look as it they had fallen onto the square so I dropped them onto the square, and stuck them where they landed. To finish it off I brushed Wink of Stella over each leaf to make it shimmer in the light. I also added 3 gems to the sentiment circle. I hope you have loved looking at my project. Please do leave comments before you click on the next button to see what Caro has made. Love this project. Thanks for sharing. 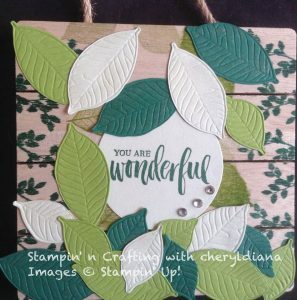 Cheryl – what a clever idea using the wooden square, I often forget about using other media with my projects as I love my papercrafting so much.